The group Ultrablue was founded by keyboardist and producer John Smatla and jazz guitarist Dave Stryker. John Smatla, a native of Cleveland, Ohio, did some great music jobs as keyboardist in NY. Dave Stryker, originally from Omaha, Nebraska, is a well-established guitarist in NY's jazz scene. His other projects are Stryker Slage band, The Blue To The Bone band, Trio Mundo, The Shades Project and The Dave Stryker Big Band. Ultrablue is the living prove that established jazz musicians are no jazz purists and also like to play melodious smooth jazz. Their first album was "Dusked 2 Dawn", released in April 2003 on the Khaeon label. A label with the impetus to release music of jazz professionals which are hardly instantly recognizable to the general public because they are mostly playing in the second row behind the jazz giants. The farsightedness of Khaeon unfortunately wasn't paired with economical success. That leads to the decision to change the label. The new album is released by 215 Records. A label with more promotional power and some rather successful smooth jazz artists like Soul Ballet, e.s.t., Bob Baldwin, Steve Briody, Greg Adams, Gene Dunlap and more. All songs on the new album except "Jungle Fever" and "The Summer Knows" were written by John Smatla who also produced the album, partly with David Mann. On the first time I listened to Shiver I remarked a certain similarity to Shakatak's and Soul Ballet's music. David Mann is performing the melody on sax, while Dave Stryker sets jazz accents with brilliant guitar riffs. On The Night With You Dave Stryker literally said borrows some money by George Benson. That isn't meant in a disrespectful way. Dave has the same caliber like this smooth jazz icon. John Smatla's arrangements, performance and songwriter-qualities are first rank too. My utmost admiration! Phil Hamilton perfectly adds a nice humming along. Guilty Pleasures is showcasing more of Phil Hamilton. You will certainly have crossed with that fabulous singer whose intense performance can be heard on albums like "A Brighter Day" (Ronnie Jordan), "Jewels" (Chieli Minucci), "Feel The Music" (Spyro Gyra) or "Touch" (Bill Evans). Hey, that's pure Samba! I tell you no Indiscretions when I already recommend you this album after the fourth track. John Smatla's accomplished sense for groovy music isn't unbeatable. He consumes and reinvents all styles of music smooth jazz stands for. The famous Michel Legrand composed the song The Summer Knows in 1971 for the movie Summer of '42, an extremely successful film. He won the Academy Award for the movie score. This sentimental evergreen is perfectly covered by John Smatla (piano) and Pete Belasco (sax). Guest star on Soul Candy is jazz celebrity Randy Brecker (trumpet, flugelhorn). Allure (Linnie, Lalisha, Akissa, Alia) add background vocals, the Brazilian guitarist Romero LuBambo ("Brazilian Nights") his typical guitar flavor. Jungle Fever was originally performed by Chakachas, a big hit in the 70's. John Smatla shows how professional musicians can refine a disco hit. Absolute the master of art: Nestor Torres (flute). Skybound is David Mann's platform. This popular sax player ("Touch", Insight", "Games") is often heard in the smooth jazz scene. Jim Savitt's "Hear& Now"), John Favicchia's "Dharma", Freddy Cole's "In The Name Of Love", Barry Danielian's "Common Ground" are pave stones of his career. David Mann plays sax (solo, overdubs), produced and mixed the song. Some years ago I had the pleasure to meet Gabriela Anders in Germany. This personality has a superb voice. None can sing so smooth like her. Destiny conjures atmosphere. The Sound Of Goodbye is a great finale in the style of a movie score. 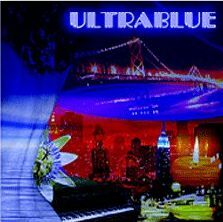 Do we need any other affirmation that Ultrablue is one of the most creative smooth jazz groups of this decade? Certainly not.